This Florida State Trooper Sergeant Spencer Ross in an unmarked Monte Carlo, attempts to pull over a motorcycle with a questionable technique. The resulting traffic stop includes the police car pinning the bike against the shoulder barrier, after which the officer tries to evade the citizen filming the encounter. 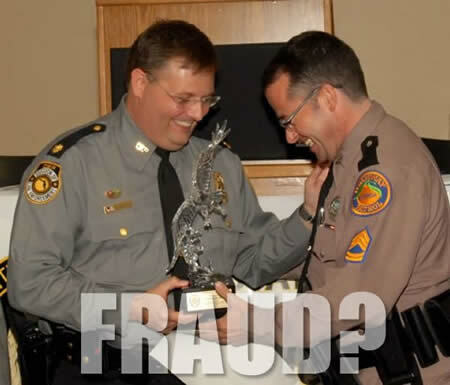 According to the Youtube description Sergeant Spencer Ross who has a history of chasing motorcycles, violating Florida Highway Patrol policies and that most of his arrests and citations of bikers are falsified. Take that with a grain of salt, but his actions in this particular incident a certainly suspect. Is putting lives in danger worth a ticket? continue? Did the officer admit to what he did? This is how bad cops get away with crime, they hide behind the uniform, badge and unmarked vehicles yet they’re really no better, and often commit more crime.